B&W P9 Signature review | What Hi-Fi? Fifty years is a milestone that deserves celebrating. A time to reflect on what has been, and what’s yet to come. While most do that with cake and a glass or two, Bowers & Wilkins has done it with a brand new pair of headphones. And a pretty special pair at that. The B&W P9 Signature headphones are B&W’s new flagship over-ears, and they mark the company’s 50th anniversary by donning the Signature branding, like the Signature Diamond and the Signature 30 speakers before them. They also take on board everything the company has learnt about headphones in the past seven years, since the launch of the first B&W P5s, with every part of the P9’s custom made and built from scratch. That’s not to say they haven’t been inspired by elsewhere in B&W’s long history though. In fact, engineered by the same team responsible for the high-end 800 Series D3 loudspeaker, they are a pretty strong nod to their heritage. Before we get to that though, let’s start with their colour. To make them stand out from the more modern black and chrome of the P range past and present, B&W has opted for a rather retro brown for the P9s. Very 1970s hi-fi. The leather is slightly different too. 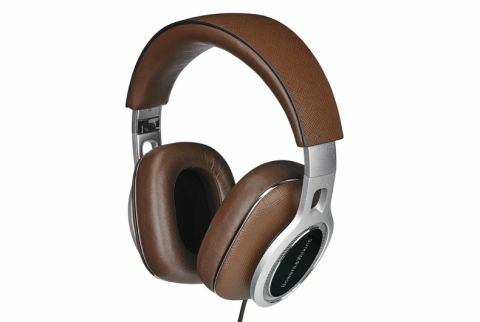 There's sturdier Saffiano leather on the outer earcups and headband, alongside softer leather on the earpads and headband cushion. The headband sits on top of memory foam, much like the P7 Wireless. They’re fairly comfortable, though those with smaller heads may find the ear cups don’t have the range of movement to allow the earpads to seal properly. Also, they do have a tendency to make your ears a little warm over long periods of listening. The chrome accents on the arms and headband have also been replaced with thicker, sturdier brushed aluminium, decoupled from the earcups to prevent unwanted vibrations affecting the sound – thinking the P9s borrowed from B&W’s speakers. Inside, the brand new 40mm drive units have been angled inwards slightly to create a more direct and natural listening experience. The driver suspension is also more like that in a traditional speaker than a pair of headphones, allowing for freer driver movement in an effort to deliver better frequency response. Despite their more premium price tag usually being associated with at home headphones, the P9 Signatures feel like they’ve been built with out-and-about in mind. For a start, the arms fold in for a more portable shape, and their closed back design means they won’t leak sound to nearby commuters or colleagues. Similarly, their memory foam earpads do a great job of muffling outside noise as well, without the need for noise cancelling, and they’re sensitive enough that you don’t need to have your phone volume at full whack in order to hear them. More of a hint is the cables they come with. The one that comes fitted is the inline remote and microphone cable for use with phones. But you’ll also find a plain cable and a 5m option for using at home with the included 6.3mm adapter. A pretty flexible pair of headphones then, but it’s in the performance that you’ll really hear where your money has been spent. You’ll want to give these a good run in to get the best from them. Ours were still improving 50 hours in – before that you certainly won’t be hearing what they’re really capable of dynamically and rhythmically. Give them time to stretch their legs, and the wait is worth it. They’re head and shoulders above what B&W has produced from its headphone range to date. And that’s from a range we’ve given five stars to across the board. Of course, their price tag is more than double that of the previous flagship cans, so it’s to be expected that these deliver the improvements that they do. There’s a real sense of space here, with vocals and instruments layered on top of one another with room to breathe. They don’t place sounds quite as accurately as something like the open back Beyerdynamic T1s, but it’s a really airy performance for closed back cans. They don’t mess around when served a complicated track either. Play Bergschrund by DJ Shadow, and the P9 Signatures show just how capable they are at grabbing onto a rhythm and holding on tightly, no matter what’s going on around it. The track’s choppy beat is delivered with precision and punch while the various elements of the busy track build around it, making sense of every electronic interlude and offbeat note that DJ Shadow can throw at the mix. Precise then, but not so much that they’re uptight – these headphones know how to let loose. Feed them Chance the Rapper’s jovial Angels, and they’ll jump behind the steel drum melody with bounce and enthusiasm, their talent with dynamics moving the song along with a good balance of pace and attack. Like other B&W headphones, the P9 Signature’s balance leans towards a slightly richer, more prominent bass, but as weighty as it is, it’s also full of detail and impressively agile. It lends solidity and authority to the overall character, and manages to underpin the whole sound rather than impress itself upon any other part of the frequency range. This ensures there’s real transparency through the midrange, delivering huge insight into vocals and telling the whole story of every strum, pluck and plonk of an instrumental. The treble is never an issue either, offering an open and natural sound in the top end that’s never squeezed or limited. Never is this clearer than with a piece of orchestral music, like Mozart’s Don Giovanni Suite KV 527 – Madamina (Leporello). Violins are crisp and textured, with depth in every bow, while flutes flutter and soar without constraint. There’s never any harshness or hardness that you might hear on lesser headphones, and everything sounds as it should, as if it were being played right in front of you. Not always easy with sounds like this. Dynamics are put to good test here too, and to great success. The quieter sections are delivered with an effective calm and consideration, but the P9s are equally happy to pick up the pace at the drop of a hat, building to a big crescendo with all the drama and showiness that a big orchestral finish requires. There’s no doubt that the P9 Signatures are a very talented pair of headphones. No matter what you feed them, they find themselves right at home, delivering a sound that’s not just accurate, but that’s enjoyable too. Their price tag won’t be easy to swallow for many, but the detail, dynamic and organisational improvements these offer over the rest of the B&W headphones range, makes them worthy of their price, not to mention their flagship status. And hey, if you can’t go all out on your birthday, then when can you?